The Cony grad set the fifth best mark in the 5k event in Miami history this past weekend. Luke Fontaine’s journey in collegiate running is coming to an end some 1,700 miles and four years removed from graduating from Cony High School. A senior on the cross country and track teams at the University of Miami, Fontaine will graduate in 16 days with a Bachelors Degree of Science in Nursing. Before he was ready to walk for his diploma, however, Fontaine needed to make sure that his last time running with the Hurricanes was a final performance of which he could be proud. The former Ram did just that this past weekend at the Atlantic Coast Championships held in Chapel Hill, N.C., clocking a time of 14:50.27 — a new personal best by 14 seconds — in the 5,000 to place 38th. Fontaine’s time was the fifth fastest in the outdoor 5k in Hurricane history, a record he saw go down last season when Sean Pezzulo posted a time of 14:42.32. 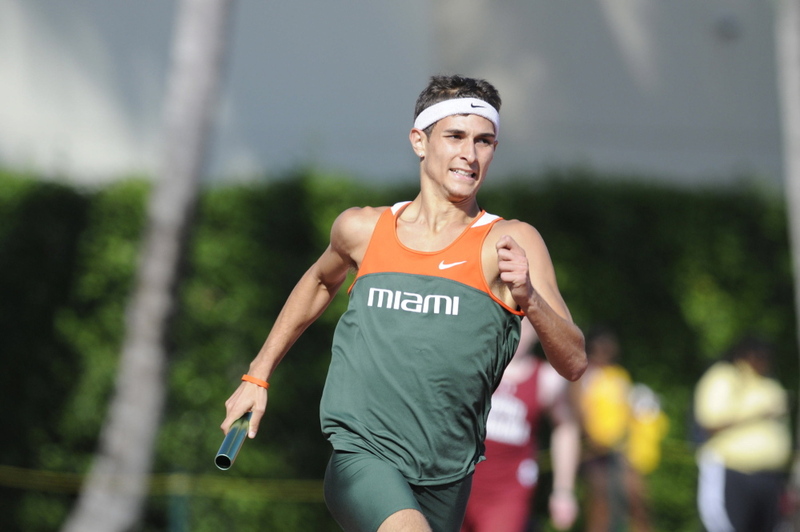 For Fontaine it was the second week in a row in which he etched his name into the Miami record books, as he posted an 8:38.24 in the 3,000 on April 12 at the Hurricane Alumni Invitational to post the third fastest time in the 3k in school history. Fontaine attributes a big part of his success to a change in strategy with his training made by he and his coaches. The Augusta native says they pulled back a little bit on the amount of miles logged, and focused more on adding strength and doing speed workouts to keep him in races longer. Fontaine recorded the fifth-fastest time in the 3k (8:38.05) during the indoor season, as well as the fourth fastest time in the 10k (31:52.46) during the cross country season at the NCAA South Regionals. That time in college is now of course coming to an end, and often times when a chapter concludes one often thinks back on how it began. For Fontaine — who settled on Miami after also looking at the Universities of Iowa and Maine and Lipscomb, La Salle and Oklahoma State Universities — it’s no different. While moving from one end of the east coast to the other for college may be difficult for some, it wasn’t as difficult of a decision for Fontaine. “I didn’t actually think about it and everyone asked me, âhow did you do it? '” he said. “One thing is when you come to a university to run track especially your team is your family. There’s not really any down time to think I’m that far away from home. Now that he has spent the past four years in Miami, Fontaine would like to remain there. He said he plans to apply to the Florida Board of Nurses to get his certification, and hopes to land a job at the University of Miami Hospital. After the track record he’s had with the Hurricanes, there’s little reason to doubt that Fontaine will carve out an equally successful career in his next endeavor.